This is the third book in the Inspector Singh series. And it is only now that the portly Sikh policeman makes an appearance on his own shores. The first book took us to Kuala Lumpur, Malaysia, the second to Bali, Indonesia. And now, the third to Singapore. 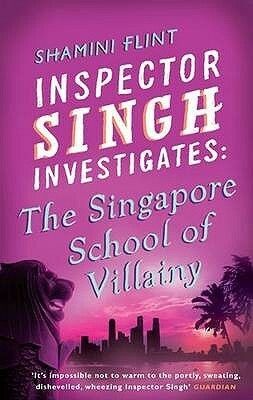 And unfortunately this third book, The Singapore School of Villainy, did not work for me. And Inspector Singh seems to never have a nice thing to say about anyone, especially his poor wife. Because I’m an excellent jaywalker, thanks to my years of having to take buses around Singapore (and all the walking to various other places in the city). As for littering, I don’t do it. Because it’s stupid. But that doesn’t mean that others feel the same way. There is plenty of litter, it’s just that the clean-up crews are too efficient. Ah well, that is Singapore’s reputation, and eh, I like efficiency and clean-ish pothole-free streets. And I do miss it, despite its idiosyncracies. So I really hate that dismissive way of describing it – and reinforcing all those stereotypes. However for me, the worst, inexcusable part is when Singh uses the term “Chinaman” several times throughout the book to refer to some ethnic Chinese characters (Singapore’s population is about 75% Chinese, 13% Malay, 9% Indians, 3% ‘others’), such as Corporal Fong and a coffee shop owner who does no more than serve Singh a cold beer. I was offended by that term. I am Chinese but I consider myself a Singaporean first, and I’m sure many other Chinese-Singaporeans feel that way too. So to have an inoffensive person being called “Chinaman” by Inspector Singh, it just irritated the hell out of me. And every time I came across it, I had to put down the book and wonder, why was I still reading this? I’m not sure why this struck so close to home. I’m sure I’ve read other books where people are put down for their race, gender, class. But perhaps because this book is located in Singapore, my country, my people, that I was just completely put off. However, finish it I did. But it was a struggle. And unfortunately I think this is the last I will see of Inspector Singh. As for the story itself, I agree with you that it was all over the place. Not my favourite book in the series. But book four (have you read it? I vaguely recall you starting with a different book than the first) is about Cambodia and a lot better than this one. It reminded me a bit of the one that takes place in Indonesia. Yeah I read book 2 first (Bali). I’m starting to think that the second book was actually the best of the three I read. Ah I didn’t realise that book 4 is set in Cambodia. That sounds interesting. Thanks for letting me know. Maybe time will pass and I will pick up the series again…?!?! I’m sorry that you feel that way. Like Chinoiseries, if it is about my country I’m ok with it. I can put up with “Chinaman” but not sure if I can put up anything which is more degrading or insulting (which I have come across). I still want to read the series though.